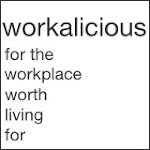 Doing more mocking up of presentation tiles today. First draft of the second tile. We want to launch here right into the important characteristics of the house design on the second tile. A section cut-away begins to give us a feeling for the space inside the house, as well as the overall structure. 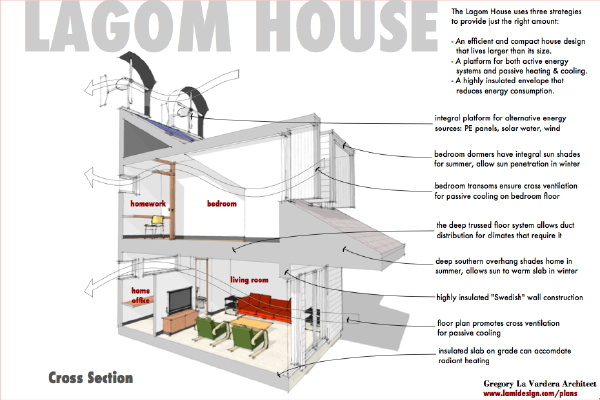 The three strategies for making house lagom are described at the top of the tile: - An efficient and compact house design that lives larger than its size. 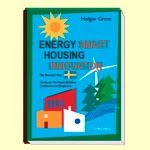 - A platform for both active energy systems and passive heating & cooling. - A highly insulated envelope that reduces energy consumption. Here another draft of the first tile. I was not sure if I should present the house right here with solar panels and wind generators on the roof. 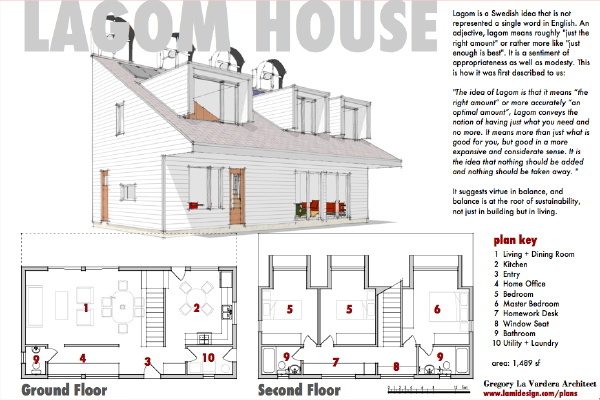 I decided to move the roof scape up to be partially obscured behind the "Lagom House" title to subdue them a bit. I welcome feedback on this - should these alternative energy accessories be flying on the first tile, or should they be introduced as options later on? My gut reaction is leave the solar and pull the wind off Tile 1. Yep, I agree, pull the wind gizmos off. Especially when you're trying to sell the 'just the right amount' concept. Perhaps if the wind turbine sheilds were translucent the underside would not be in such dark shadow. There would be much less contrast and the eye is not drawn directly to them. A good point - they are dark grey in there and I could paint them white, in which case the shadow will be more of a grey. Worth looking at before taking them out. I agree with others that eliminating the turbines and focusing on solar panels might be better. The wind turbines would have a more limited applicability geographically than solar, which is pretty much universal. The orientation of the ridge may not necessarily correspond to prevailing winds in the area. In the US, most prevailing winds would be from the west, so the turbines would need to be mounted at 90 degrees to the ridge, unless they rotate. Will the plans point to a source for the turbines? Unless there is a source available for turbines as drawn, it will be hard to find anything that will match aesthetically, so changing the color may be of limited value. Solar components are very widely available and are becoming pretty universally accepted aesthetically, whereas people in many areas are still afraid of noise, safety, and aesthetic problems with turbines. Have you checked on what size and number of PV panels would be adequate to power this house? There may be enough roof area to accomodate PV to power the whole house if you use the tops of the dormers and the area above the porch overhang. If you're planning on solar hot water, there is a lot of mechanical equipment associated with the system, and the house right now doesn't really have a space to accomodate that. You'd need a large storage reservoir for the hot water, usually provided by several 300-500+ gallon tanks, space for mounting the manifolds, circulator pumps, and electronic controls, and space for a backup boiler or water heater. A version of the house with a basement or with a larger mechanical room might provide for all the equipment. Will the attic space in the house be accessible for storage of luggage, Christmas decorations, and old high school yearbooks? Without a basement, I think this could be a good option. As always, great work with the illustrations. Wind power is subject to site conditions impossible to predict in the case of a stock house design, and it clearly could be in conflict with the solar orientation of the design. Yet small home wind power seems to be exploding and I see lots of innovation going on in this category. The units I have shown are simply a fabrication by me - generic. My concern here is more for just the visual in this graphic. I plan on keeping the wind power in the cross section on tile 2. Solar water heat need not have 300-500 gallon tanks if this is not the sole source of hot water, and in fact a system supplementing an on demand water heater can be put together with a storage tank no bigger than an ordinary water heater. Remember the high insulation values will reduce demand on the system. The same for PV - it should be possible to offset much of the use with a modest system. No need to cover the entire roof. The attic space will be accessible if needed and may be useful for mechanical equipment but more likely a fairly ordinary air handler rather than water tanks although on demand units could easily fit in that space. And yes - xmas decorations and suit cases too I imagine! I am not sizing or designing any of these energy systems. There are too many variables, and just as many preferences - the goal is to make a platform that will support many solutions. Have you seen the Energy Ball? The type of unit shown in my drawings are fixed in orientation and are used where there is a prevailing wind direction over an architectural element such as a parapet or roof peak. Perhaps not as applicable to a small structure such as a house.